While we prefer hostels that are privately owned and operated, some hostels are part of one of the four biggest hostel networks in the country. Some of them have a yearly membership to pay that offers you discounted price on accommodation. We recommend that you only buy your membership if you know that the amount of nights you intend to stay in that type of hostel would cover the cost of the membership. Otherwise, you may feel restricted in your choice of hostels. BBH groups independent hostels around New Zealand but has seen its numbers of hostels decreasing at a fast pace in recent years. All BBH hostels are independently owned, therefore some hostels are very unique and has more character. The YHA hostel locations cover almost all of the major attractions and must-visit places in New Zealand. All YHA hostels have satisfying standards. However, while some are excellent, service is sometimes uneven, even between two YHA hostels in the same city. A good point about YHA is its international membership card, which is recognised worldwide – great for globetrotters! The Australian company offers much larger than privately owned hostels. That said, a free membership is great but expect little value to it. 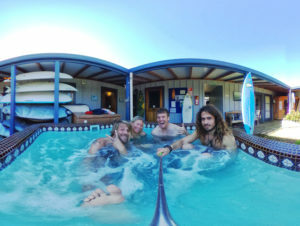 The best Nomads hostel is definitely Queenstown – a must-try hostel! Of course, we can’t deny that relaxing on the rooftop in Nomads Auckland is an awesome way to end a day exploring the city. Base only has strategic locations. It is known to be the “party hostel” where a younger and less sober crowed meets. It should only be considered when other options are full, with the exception of the Paihia Base hostel, right on the beach.